Have you ever received a startling phone call or an ominous letter warning you that your car’s warranty is about to expire and urging you to purchase an extended warranty? If so, you’re not alone. And you should proceed with caution. For the risk averse, paying to extend the manufacturer’s warranty (technically an extended service contract) sounds worth it, if for peace of mind alone. However, third-party companies hawking extended warranties are notoriously shady — and often pretend to be legitimate service providers, only to months or years later be proven fraudulent. Is Extending Your Warranty Ever Worth It? It depends on your tolerance for risk. For many, the few thousand dollars spent on a manufacturer-backed warranty over the course of a few years is a small price to pay for the peace of mind that if anything breaks, it will get fixed with very little hassle. As with most types of insurance, the money users pay for the extended warranty is typically more than they will ever get out of the plan. But for some, not having to speculate whether or not a damaged part could end up putting their car in a very expensive repair shop is more than worth it. When you purchase a manufacturer’s extended warranty on your new or used car, you can rest assured that if your car breaks down, trained professional mechanics using original parts at a certified repair shop will get your car up and running again. Third-party warranty providers, on the other hand, have no business ties with the company that made your car. Often, these third-party plans do not cover essential repairs, leaving their clients high and dry when it matters the most. While not all third-party companies who sell extended warranties are fraudulent, there are several warning signs that they might be. Hello Mr. Roboto: In 2016, The Federal Trade Commission refunded almost 6,000 people over $4 million that they had been conned by a robocall hawking extended service contracts and pretending to associated with the car’s manufacturer or the dealership where the victims had purchased their car. For the unsuspecting people who purchased the coverage from the calls, they found that when their car needed a repair, their request for refunds for service were ignored. What makes these sort of calls particularly troublesome, the FTC warns, is that the robocaller may know personal information about your car and warranty, leading you to believe they are legitimate. Crank Up the Pressure: In many cases, consumers felt pressured into buying coverage from third-party vendors over the phone, before doing proper research, because of high-pressure hard sales tactics used by telemarketers. One journalist writing for NBC News reported that while being solicited by one such fast-talking telemarketer, he was told that if he didn’t take advantage of the can’t miss the opportunity while on the line, the company’s computer system would “automatically delete” his files at the end of the call. Any caller that talks too fast and pressures you to make a snap decision should be viewed with a healthy dose of skepticism. Pay to Play: When pressed by a high-pressure telemarketer, many discerning individuals ask to hear more about the plan — some even wisely ask to be sent a written copy of the terms and conditions they are agreeing to before they make a decision. Often, the response to this perfectly reasonable request is that terms will be sent after an initial down payment is processed. You know what that means: the telemarketer will eagerly take down your personal information and credit card info, you will get charged, and you will never hear from the telemarketer or the company ever again. Fear Monger in the Mailbox: Telemarketers on the phone are easy to ignore, especially if you can determine when they’re calling with caller ID. Genuine looking mailed documents can be trickier. Sometimes, marketers disguise sales advertisements as startling manufacturer or DMV warnings with titles like "Final Notice: Expiring Auto Warranty,” encouraging recipients to call a number for more details. Spoofing Isn’t Just a Funny Noise: You can usually tell when a telemarketer is calling: there’s a 1-800 number incoming or a marketing sounding name appears on the caller ID. But companies that take part in spoofing pretend to be someone they’re not. Advanced spoofers can make their name appear as something different on the caller ID or send emails that look like they are coming from a different email address (like, one from an auto manufacturer’s website) when they’re really coming from a third-party sales group. 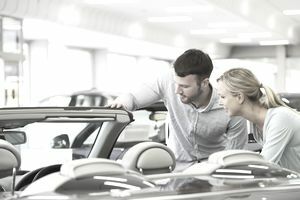 Manufacturer Backed or Bust: For the most peace of mind, if you’re going to purchase an extended warranty, you should purchase the factory extended warranty directly from the car’s manufacturer. It might cost you more than the third-party telemarketers are advertising, but you’ll rest easy knowing you can trust the policy itself. Use BBB and FTC Judiciously: If you get a solicitation from a company selling extended warranties, whether over the phone, in the mail, or via computer, it’s smart to do a quick search on the Better Business Bureau (BBB) site to see what their reputation is and whether previous clients are satisfied. If you’re in the unenviable position of having already purchased a fraudulent extended warranty, you can also report it to the Federal Trade Commission and the BBB for help processing a refund claim. Always Ask for Details: When you’re on the phone with a telemarketer and things are sounding sketchy, it might be better just to hang up. But if you’re tempted to purchase the extended warranty that they’re selling because it sounds like a good idea, make sure it’s not too good to be true. Ask questions to make sure they are who they say they are: if they claim your warranty is expiring soon, play dumb, and ask them to which of your cars are they referring? If they can’t tell you the make and model of your car, how do they know when your warranty is expiring? If they ask for a payment, ask to see the terms and conditions first. Play dumb if you need to, but ask for as many details as you want — it’s potentially thousands of your hard earned dollars at risk; don’t you want to spend it as wisely as possible? Never Give Personal Information Out Over the Phone: Do they need your credit card number? Social Security number? Sorry, they’ll have to send more information on what they’re selling first. Don’t Give Into Pressure — And Don’t Get Antsy! : Telemarketers are counting on you to react, and they’re good at it: they speak quickly so that you will begin to feel anxious. They tell you this is a once in a lifetime opportunity, that there’s no coming back to this offer, and then you feel even more anxious — and filled with that perpetual “fear of missing out.” Don’t panic — remain calm, and speak slowly. If something sounds too good to be true, or you need to act right this second in order to keep something, it’s probably too good to be true. Know You Have Options: Buying a warranty extension is not the only way to “purchase” peace of mind. If your warranty is running out soon, start setting aside a bit of money each month to “self-insure” against potential maintenance costs or other repairs. Not only will you have peace of mind, but in the likely event your car doesn’t need expensive repairs, you’ll still have the money you would’ve spent on extending your warranty. No matter whether you choose a manufacturer backed warranty, an extended third-party warranty, or no warranty at all, be sure to read the fine print and do your research before investing in anything. Your wallet will thank you later.